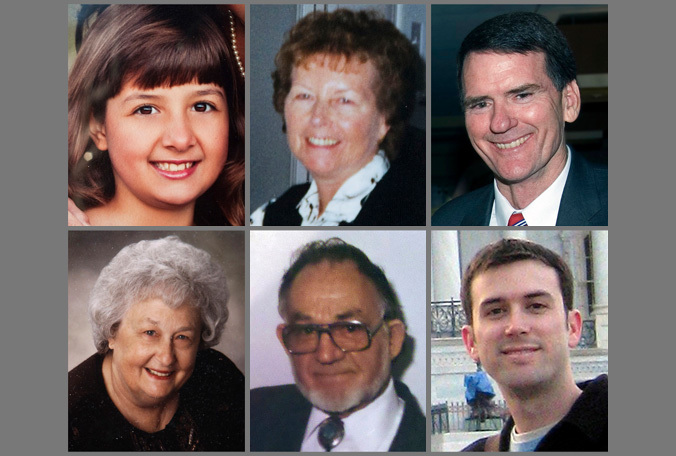 Victims of the Tuscon, Arizona rampage. There are some things that are just too hard to swallow. On January 8th in Tucson, Arizona, a clearly deranged 22-year old, Jared Loughner, purchased ammunition from a Walmart, took a taxi to a Safeway supermarket where a political meet-and-greet was being staged by U.S. Representative Gabrielle Giffords, and then opened fire on Giffords and her constituents because … he wasn’t happy with her response to a question of his at a previous political rally. The incident left 14 wounded and 6 people dead, including a judge and 9-year old Christina Green. Yes, there are some things that are hard to swallow. One such being that “we the people” of the United States have brains. This is obviously not the case because we continue to allow gun-related tragedies to occur. Really, it pains to me write this, because I would like to believe that despite soaring crime, violence, racism, and politically correct intolerance we are a nation of humane, rational, peace loving people. I would like to believe that Michael Moore was wrong in his depiction of us in his film “Bowling for Columbine ” as phobic gun loving sheep willing to be brain washed by political rhetoric, big business and organized religion. I would like to believe that lessons have been learned in the wake of the horrific tragedy this past week in Tucson, Arizona. But, you know what? I’m wrong on all counts: None of the above is correct. The argument on gun ownership should be a moot point. It’s not. Can someone please explain how many more dead 9-year olds we need before we realize that guns have no place in our society? This is NOT for hunting. I’ll be honest with you all here; I’m not interested in political rhetoric. I’m not interested in being engaged in discussion on the issue. I’m not willing to debate to this issue and have no interest in varying interpretations of the Constitution. I AM interested that in the United States on average, there are 30,000 gun-related deaths. I AM interested that a 9-year old was killed last week. I AM interested that our Freedom of Assembly cannot be enjoyed because of GUN NUTS and our insipid GUN LAWS (or a lack thereof)! Trust me, I’m LESS worried about the sudden uprising of a tyrannical government here in the United States. I’m MORE worried about the possibility of having my head blown off at the local supermarket or 7-11. Loughner purchased a Glock 9mm handgun at a Sportsman’s Warehouse. Such a gun is not used for hunting. In fact, the gun used in the shooting held a clip with 31 rounds -more than triple the normal capacity of this gun’s magazine. A “federal assault weapons ban” established by the Clinton administration in 1994, prohibited such magazines for this gun that held more than 10 rounds. The Bush administration purposely let the ban expire. It didn’t happen by accident, it happened on purpose compliments of the same presidential administration that sent almost 20,000 Americans to their deaths in Iraq. In the United States, federal law only prohibits the sale of firearms to those who have been convicted of a felony or to anyone who has been “adjudicated as a mental defective”. Of course the implementation of this law varies somewhat from state to state, thus illegitimizing the term “United States”. After posting a Youtube video claiming that the school acted in violation of the U.S. Constitution, Loughner was denied further attendance at Pima Community College until the school received medical proof that he was not a threat to himself or others. He also had a prior arrest record. Loughner was clearly deranged. His school knew it, his friends knew it, the local police knew it, and he pretty much made it publicly known via his ranting and raving internet posts on his MySpace and Youtube accounts (et al). Nevertheless, he was easily able to purchase the gun and ammunition since Uncle Sam apparently didn’t know it and obviously could care less about what everyone else knows. So it was just another case of “hey, let’s give the boy a gun” and ask questions later – as in good old American tradition espoused by the National Rifle Association (NRA) and many Libertarians and Tea Party members. Something is wrong in America: we seek to ban toys from McDonald’s Happy Meals to protect our 9-year olds’ health, but then we also sell at Walmart and places like Sportsman’s Warehouse 10-round clips for about 40 dollars to anyone who wants them. No questions asked. This sad commentary on our society gets worse. In Arizona, the legislature was spurred to sign emergency legislation baring protests within 300 feet of a funeral and within an hour from its beginning or end. All because a church group claimed it would picket the funeral of 9-year old Christina Green and the other the shooting victims. 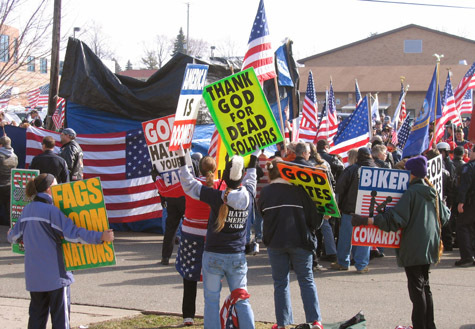 Yes, in the name of God, these fervent zealots regularly stage protests at funerals of homosexuals, AIDS victims and in some cases, even soldiers and shooting victims. Their website, http://www.godhatesfags.com/, sports deplorable rhetoric including endearing mantras such as “God hates America”, “God sent the shooter!” and “Praise God for ALL his works, and BE YE THANKFUL!” Yes, another twisted case of praise God and pass the ammunition… sort of what Sarah Palin (“don’t retreat, RELOAD”) stands for. In light of the above and at risk of writing something sounding like the fevered ramblings of the shooter, I feel implored to say that once again our government and society has failed us. Moreover, the media and our political parties, rife with political rhetoric, have done nothing but conflagrate things. The argument that political debate has become too heated, and that it possibly played a role in the mindset of the shooter, is not only valid statement, it’s also an understatement. Once upon a time we had politicians and journalists. Today we have political personalities and news analysts, and the line between journalism and entertainment has become blurred. What’s more convoluted is that under the guise of “fair and balanced ” journalism we allow political buffoons to sling around gun metaphors and war mongering labels such as “traitor” and “treason” only to incite hatred and violence against those with opposing political views. Some are vehemently engaged in emotional terrorism by politically and anally labeling of all things these days: conservative, liberal, ultra-conservative, Democrat, Republican, Libertarian, vegetarian, etc. Lord, things were so much simpler when all we had to worry about were the communists! It should be obvious that politicians and political pundits should educate, not incite hatred. Nor should they be allowed to pervert the news media to brainwash the public and spawn hate-mongering followers. But then again, as I mentioned above, history lessons, such as one from Nazi, Germany, have not been learned. It’s mind-blowing and it’s ponderous to me … but for people like Rupert Murdoch , owner of FOX News , it’s great entertainment and good ratings. Yes, the argument on gun ownership should be a moot point, at this point. There is no justification for 30,000 annual gun-related deaths. I disagree. Totally disagree and will get back to you when I can figure how to keep it within 4,096 words. 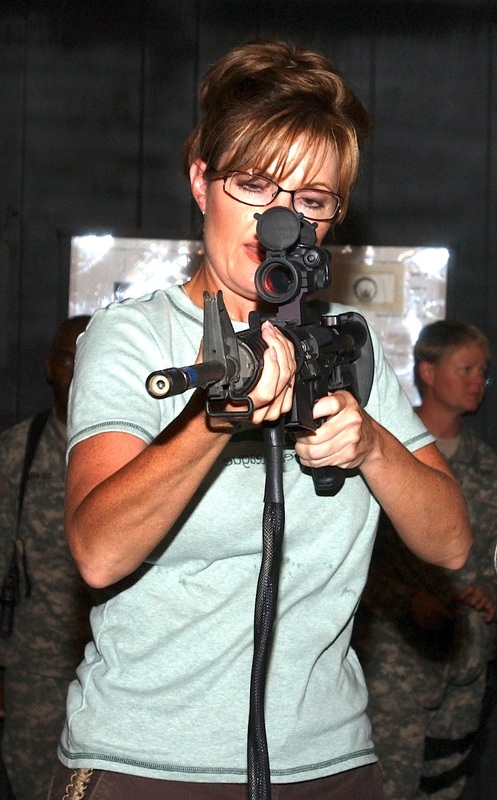 When the media constantly targets (another gun related term) someone they don't agree with political and tries to deride them and brand them as someone to go after and blame as many left wing media types have done with Sarah Palin… they DO make a blood libel against her and being a Jew and a woman I can 100% concur it was the RIGHT term to use and I would add they would love to crucify her for anything… even a crazed kid who lost it and decided to take the law into his hands.I think gun control should be stronger… but my aunt who was a raging Democrat believed strongly in a person's right to bear arms as she felt had Jews in Germany been allowed to own guns they would have shot and fought back against the Nazis who came to take their homes away and taken out a few Nazis with them. Might meets might in her eyes.I have friends that go hunting, I don't see the beauty of it and am not interested in venison.. I barely eat meat anymore these days but to each his own.The event is a sad tragedy that illustrates the need to deal with mental illness and not ignore it for fear of giving a child a label and dealing with it.It is not about America and if you think America should change so much… feel free to please come home and help change it in a democratic process.America is beautiful. America is wonderful. I love America. I do not love rambling tirades using verbal Molotov cocktails against anything you disagree with politically or are you just playing devil's advocate?We need to stock attacking people who are trying to make a difference in America whether it is Sarah Palin or Barak Obama, give them an A for effort and be happy we do not live in Europe where nihilism seems to be an accepted political belief and anarchy an accepted political option.Donate to a fund dedicated to those who died as I am sure some will be made and hope and pray that we catch the next lost child, lost soul who is losing his mind before he goes "postal" and lashes out against someone he thinks he has an argument with such as the man who shot President Reagan hoping to win the affection of a movie star. Note… I disagree with your thought process.. I do however feel your pain over the horrific loss of life in Arizona.